Were children safer in the good old days? 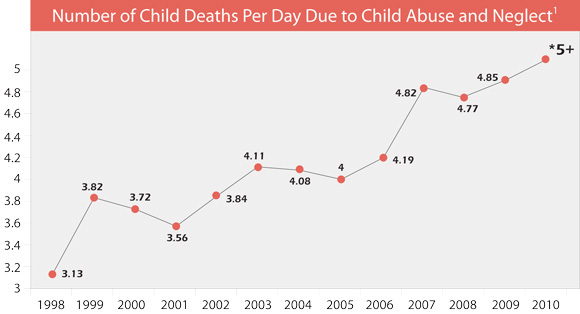 But the statistics I seem to find online seem to imply that despite the media hype around kidnapping, serial killers, child trafficking rings etc, relative to the population, children are safer than ever before. "Were children safer in the good old days?" What age are included when talking about "children"? What risks are included and excluded in "safe"? When were the "good old days"? What geographic regions are included? Just the US? UK? Western-style cultures? The globe? Interpretation #1: Children under 5 years, all mortality risks, 50 years ago, western countries. 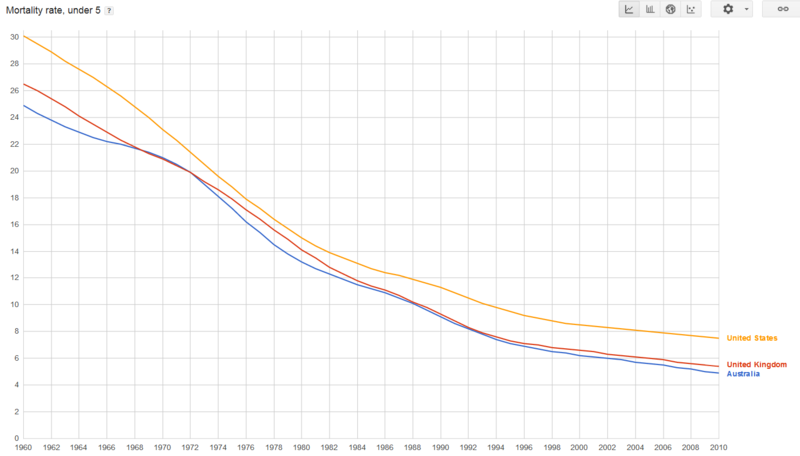 Broad summary: Infant mortality has decreased greatly in the past 50 years. But perhaps they didn't mean to include the fact we have vaccinations and other health improvements, and meant to talk about violent crime? Intepretation #2: Youths 12-17, victims of violent crime, 30 years ago, USA. Broad summary: Youths are less likely to be victims of violent crime. No, no, maybe they meant to include all the risks of car-accidents and injuries playing sport? Intepretation #3: Aged 1-4 and 5-14, deaths due to injury, 30 years ago, USA. Broad summary: Children younger than 15 are less likely to die of injuries. Interpretation #4: Any ages, kidnapping, >15 years ago, USA. 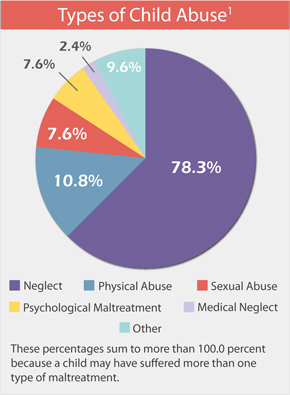 Until recently, the nature and scope of the problem have been unclear because existing crime data collection systems—such as the FBI's Uniform Crime Reporting (UCR) system and OJJDP's National Incidence Studies of Missing, Abducted, Runaway, and Thrownaway Children—do not collect law enforcement data on kidnaping. Fortunately, that is about to change. In partnership with the Bureau of Justice Statistics, the FBI is supplanting the UCR with the National Incident-Based Reporting System (NIBRS). This will enhance our understanding of youth abduction and create a comprehensive picture of kidnaping offenses. Fortunately, kidnapping is very rare. Kidnapping by a stranger (presumably the relevant subset) is rarer still (a little over a quarter of the offenders, according to the same source). When we talk about dangers being faced by children, being kidnapped by strangers on the street doesn't contribute much to a child's overall risks. Intepretation #5: Various ages, child abuse, 15 years ago, USA. Note: The y-axis on the graph does not extend to zero, which serves to exaggerate the rise for people unfamiliar with the technique. Also, these are absolute figures, not per capita figures, so the growth should be tempered by the approximately 10% population increase over that period. Without wishing to dismiss the seriousness of this issue, this problem does not seem to fall into the type of issues that the original claims expressed concern about - the dangers of letting their children play on the street. Without clearer definitions, it is impossible to give a precise answer, but it seems under a number of different measures, these are the good days when it comes to child safety. Not the answer you're looking for? Browse other questions tagged safety children . Has president Trump been “very strict on Commercial Aviation”? Is the fertility rate of women who work over 2 children anywhere in the world? Does lowering the legal BAC make driving safer? Does wearing a bicycle helmet make the cyclist safer? Does counting with fingers diminish the ability to work with numbers in the future for children? Does the Uzbekistan government force children to perfom slave labor harvesting cotton? Can children with peanut allergies be triggered by the mere presence or smell of peanuts nearby? Do day-care centres lower the IQ of children?